I layered Rose Red, Chocolate Chip and White. The White layer was stamped with Greenhouse Garden in Pretty in Pink, Regal Rose and Rose Red to create my own ds. The bunny was stamped on Close to Cocoa in Chocolate Chip craft ink and clear embossed. 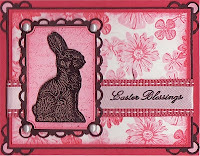 The Pretty in Pink layer that the bunny is on was stamped with En Francaise in Pretty in Pink, as well as the spatter pattern from Itty Bitty Backgrounds in Close to Cocoa and White craft ink. The Pretty in Pink satin ribbon was stamped with the sentiment from Abundant Hope in Chocolate Chip craft ink and clear embossed.